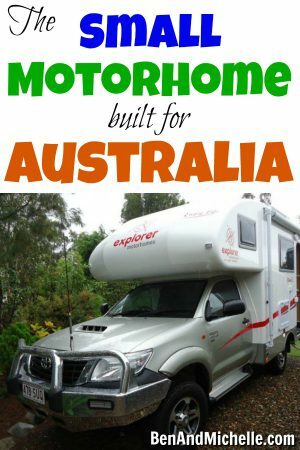 Last year I wrote a (desktop) review of this awesome small RV/motorhome over on my other blog. 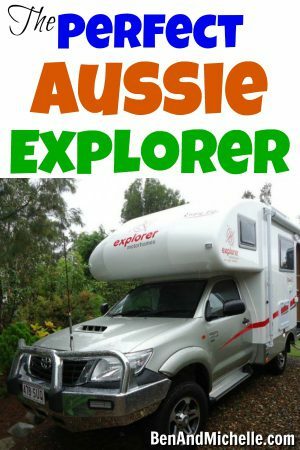 Well… I use the word ‘review’ lightly, basically it was just me gushing over this Australian made compact motorhome to my mostly American audience. 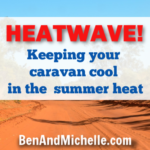 Now that we’ve been on the road and know what kind of travel we’d like to do, we’re pretty sure that a car and caravan combo would work the best for us (ahem… and it’s what we can afford). But, if money were no object and we were doing a trip, rather than a lifestyle… then THIS, would hands down be THE rig that I’d want to take. 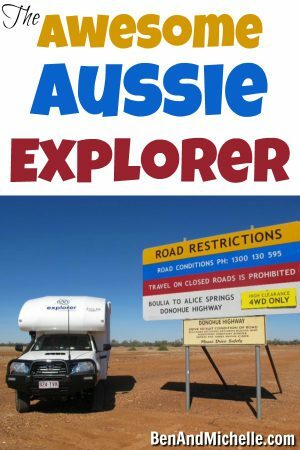 Built right here in Australia (Redcliff QLD) the Explorer Motorhomes range is slowly growing, but sticking to model of 4×4 motorhomes built with quality finishes. Let’s get the big one out of the way first, it’s 4WD. Or even 6WD if you want the Discovery. 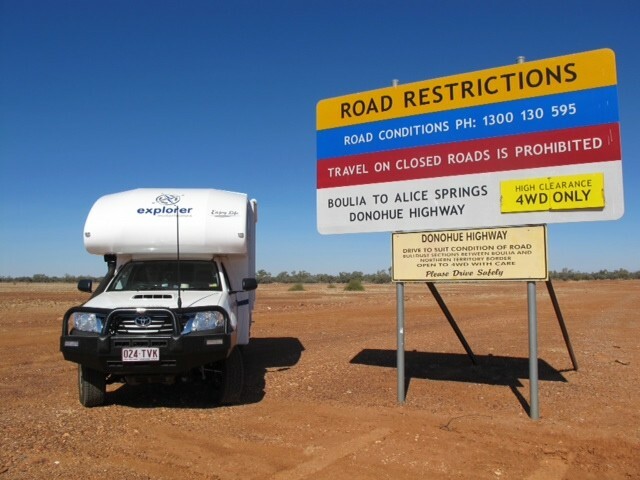 Here’s an article in the Wanderer magazine showing how they took the Spirit on the Canning Stock Route. There’s not too much that will stop this motorhome. 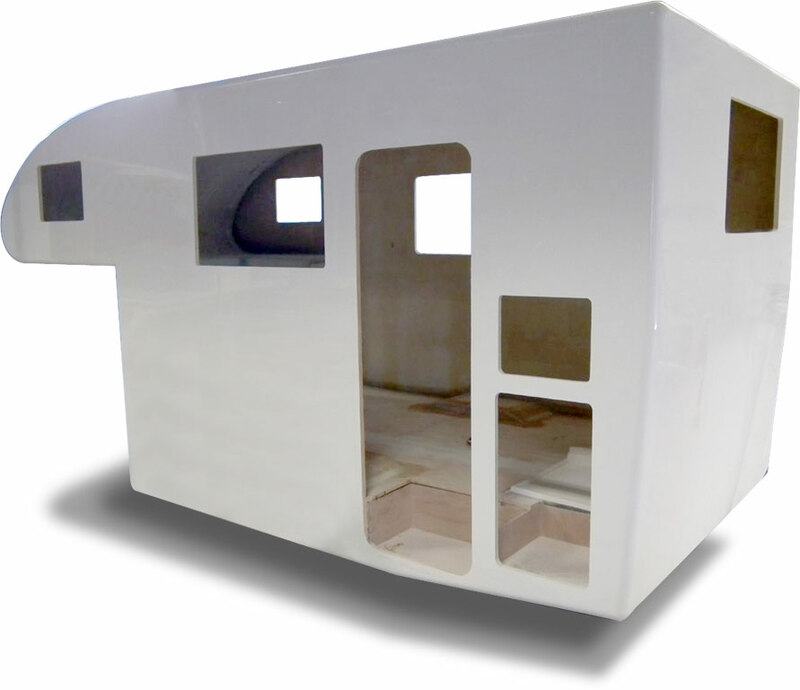 One of the recurring problems that pop up with older motorhomes and caravans is water damage, and that’s where the fibreglass shell just can’t be beat. Because the shell is made as one piece, there aren’t the opportunities for water to seep in and cause damage. And it’s light, which is an awesome bonus too. I am stoked with the layout of the Explorers and all three are total winners for me. 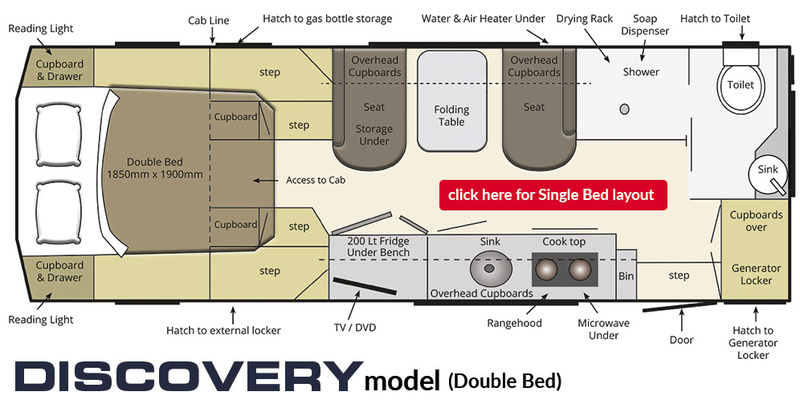 All three models have basically the same layout, except for some differences in the bed and dinette layout. But both layouts utilise all the available space in a functional yet comfortable way. The pull out beds first showed up in the Vision model and it was the first time I’ve seen this novel approach to the overcab bed. 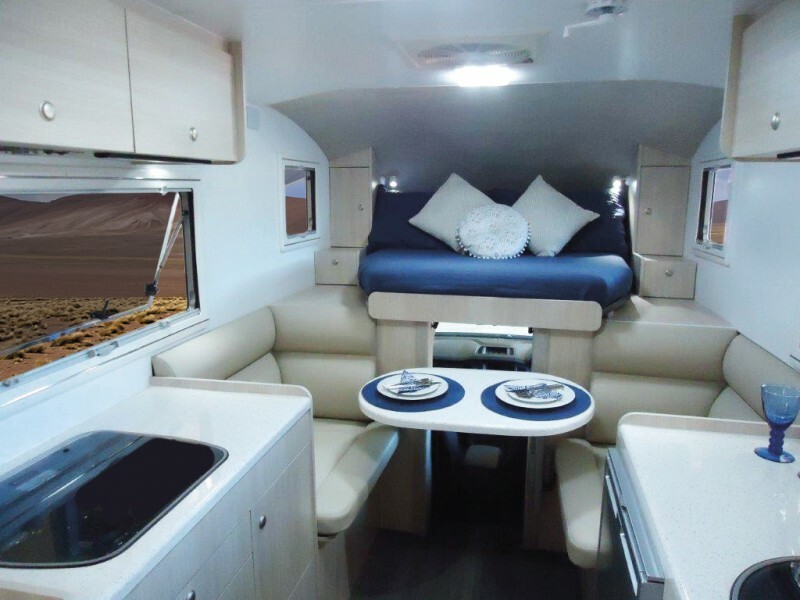 Look how much space you save by putting the beds out of the way above the cab, but you no longer have to sleep east/west where one person gets jammed up into the nose of the space and then has to clamber over the other person if you need a midnight tinkle. Sure, the beds aren’t fully made all the time, but the effort required to ‘make’ the bed looks infinitesimal. And to me, the bed still looks like it would be usable in the compacted up position. It looks like you could scoot up there and recline to watch a movie, read a book or play video games. I thought the pull-out single beds were awesome, but I saw the double bed version in the Spirit, well….! Could you get a more clever design?!? I think not. 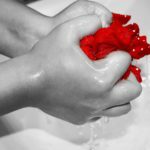 There was a time when a seperate shower was an absolute, no-negotiation, I’m-not-even-going-to discuss-it MUST have feature for me. Now that we’ve been on the road living in a camper trailer, I’m not so sure about the full shower and the space it takes up. When you realise that you generally only use your shower once a day (if you’ve got good water supply) I’m actually okay with the idea of a wet bath. But, having said that, I do love the idea of being able to have a shower in my own bathroom when we’ve got full hookups. Not having to time my showers for when it’s less likely to be busy, no having to juggle lotions and potions on the non-existent shelves and hooks, and not having to wear thongs in the shower! It’s a luxury I’ll happily endure. The beauty of travelling around Australia is that you get to enjoy some spectacular scenery in (generally) mild temperatures. So most of your time will be spent outdoors enjoying the view or sitting around a campfire. But you’ll still need a space big enough and comfortable enough to eat, work a bit on the computer and play some board games… when it’s raining. You’re not going to be in there all day, everyday. Just those days when the weather turns crap or it’s just too darn hot out there. How good is that kitchen!? Like, there’s actual bench space to prepare food, and put dishes, and heck, enough space to swing a cat even! I’m stoked with the kitchen space. This all fits into the size of a (large-ish) parking space. 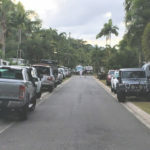 No having to stress about whether there’ll be 5 car spaces in a line at the supermarket that you can park your 13 metre rig along. No worrying about whether you’re going to bottom out on the speed humps. You’ve still got to be mindful of your height, but at 3.1m high, it’s not like you’re having to re-route because of rail over-bridges or anything like that. Yet everything you need (and probably a fair bit you don’t need, but it’s sure freakin nice to have) fits into this small package. 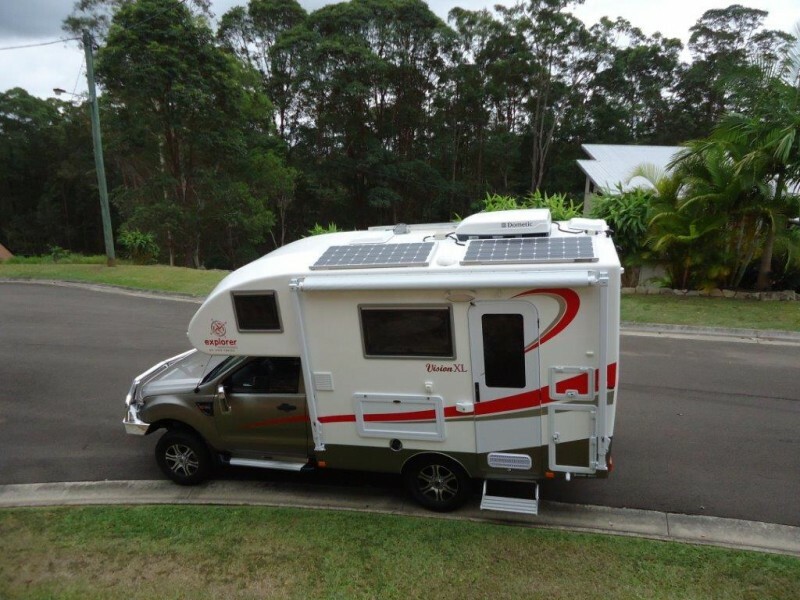 With three 115 watt solar panels (optional) on the roof helping to charge up to three 125 amp hour batteries, I’d expect that would take care of most of our electricity needs. It’s not gonna run the air conditioner but it’s enough to keep the fridge cold, the lights working and our laptops and phones charged up. Awning – must have. So happy. Insect screens – hello, we’re talking about Australia here. 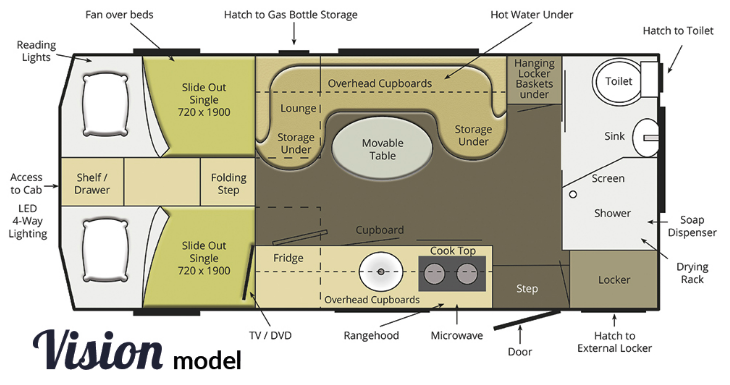 Okay, so I have only one real concern about the Explorer Motorhomes, and it’s storage. Now, we’re pretty minimalist travellers, so I don’t need copious wardrobe space, and we don’t carry much in the way of just-in-case items. But, there are a couple of things we use every day, that I don’t see space for in the Explorers. 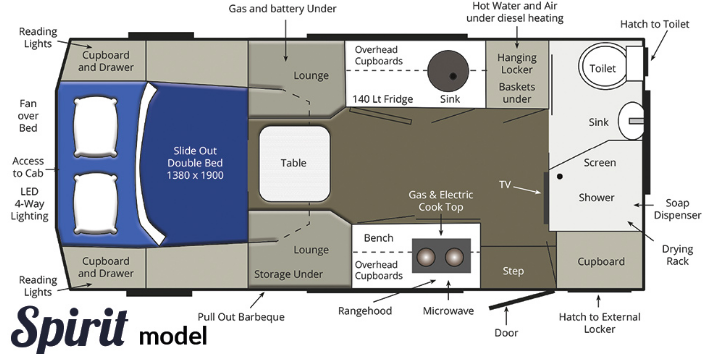 I can see the BBQ spot, and the cubby for the generator, but where am I going to put the camp chairs and table? And even though I said we don’t have much in the way of just-inc-case items, we do like to carry jerry cans of diesel and water. And a tool box, well bag actually. With that small addition, I think I’d be one VERY happy camper … heck, you know I don’t need that small addition to be happy… but I do need a lot more cash than I currently have. 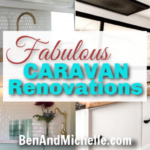 What do you think of these small RVs / motorhomes? 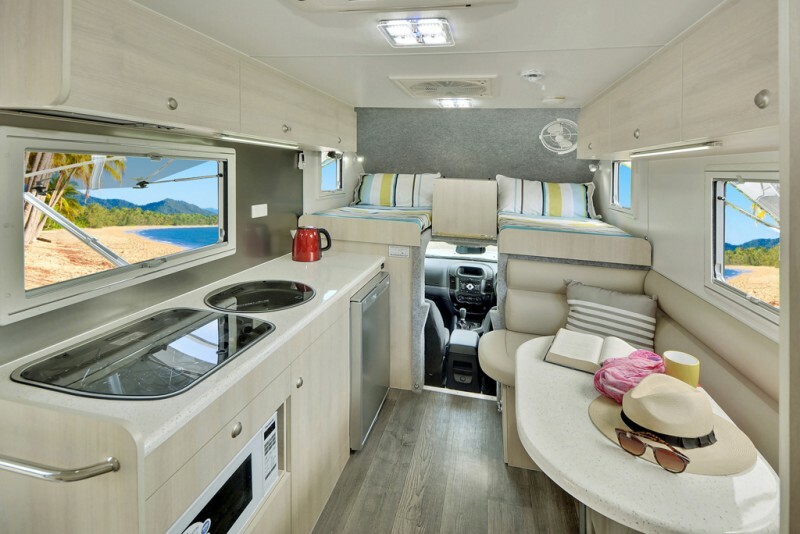 Head on over to the Explorer Motorhomes website to see all the details, if you’re even slightly enamoured by these beauties, you’ll be on their site for ages. Michelle is the half of the duo that is planning everything to the n'th degree, making sure that we're on budget and waving excitedly to any, and all, animals.